Preheat oven to 300. In a large mixing bowl, using your electric mixer, beat the egg yolks and zest until the eggs are creamy. Slowly add condensed milk and mix until well combined. Add key lime juice and mix to combine thoroughly. 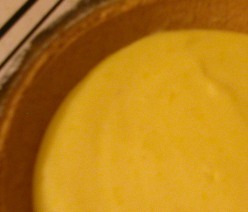 Pour into crust and bake 15 minutes or until the pie is "set" and no longer feels liquid to the touch. Cool on wire rack, refrigerate. *Note: For an authentic pie, you need the juice of fresh key limes. Using a juicer is the most efficient way to extract the most amount of juice from tiny key limes limes. I was able to yield 1/3 cup of juice from only 10 (2 inch diameter) limes using my juicer. If you have to use bottled juice, make sure it is from actual key limes (the juice will be a pale yellow) and not just (Persian) lime juice with citric acid added to make it tart. Who knew key lime pie was so easy to make? It's one of my husband's favorites so when I saw fresh key limes in the store, I couldn't resist. The bag came with a recipe, but I upped the amount of zest and juice it called for to yield a more tart pie. It came out as well if not better than the pies I've had from places that specialize in key lime pies.